While today’s guest, Marcus Blankenship, is currently a solo-consultant, he started out like many of us at a big corporation where he worked for 14 years. He knew that wasn’t the path for him and worked his way out by starting a web design agency with a friend. 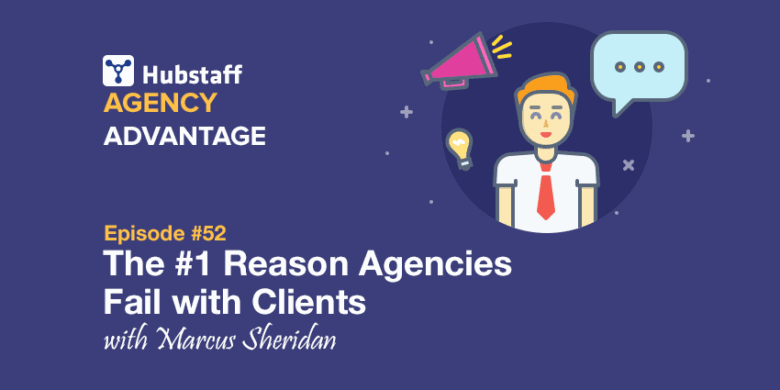 When building that agency up to a team of over 20 people, Marcus was like most people; he didn’t have a real plan. When he had more work than his current team could handle, he hired more help and thought that, as long as he hired “go-getters”, he wouldn’t need to learn management skills. He also thought that if he wanted to make more money, he would have to expand his team. He was wrong on both counts, and today Marcus has taken everything he learned from that experience and helps other agency owners avoid those same mistakes, especially those around hiring and managing developers. The common theme across all of his lessons is that you need to be deliberate about everything you do. You can’t expect your agency to grow on its own, and you can’t expect your team to become highly effective without some effort on your part. Things will never be easy by accident. In today’s podcast, Marcus lays out exactly what is needed to achieve build and manage your team, and create a plan of action that works. Relying on word-of-mouth is great when it works, but everybody who has depended solely on referrals for work knows that those referrals can dry up without warning. You need a plan and a process to reliably drive new prospects into your pipeline. To succeed at sales, you don’t need to be the high energy extrovert jock/bro stereotype we usually associate with the typical sales person. If you want to break the “feast or famine” cycle and build a real business, you need to learn how to sell, and it isn’t something you can just outsource. It’s your agency, so you need to be an integral part of the sales process. You can’t care about a project more than a client does. When all they want is a $5,000 website, don’t build them a $50,000 one because you don’t want to do work that is beneath you. Don’t intentionally build a poor product, but cater to their needs and put your idealism aside so that you can make a profit while still delivering them the results they are looking for. Most agency owners hire because they think that is what they are supposed to do when they have more work than they can handle. Unfortunately, it is all too common for agency owners to make less money as they get bigger, or at least not substantially more. The trouble with this is that your overhead has increased significantly and you need to make sure you have a full pipeline of projects so you can make payroll. When you are thinking about expanding your team, take a step back and re-evaluate your goals to make sure that is what you really want. Remember, having more work than you can handle is the perfect time to raise your rates. Always be on the lookout for good potential hires, but at the first sign of excess work don’t immediately bring them on as employees. Start by doing a test project to make sure that you like how they work and they are a good fit for the team. When you are confident, bring them on as full-time contractors so you can evaluate not only their fit but whether you have enough work to keep them busy. “You need to hire a go-getter!” is what we keep reading and hearing on management blogs and in casual chats with other agency owners. And you want to believe that’s all that is needed because it means you don’t need to do anything as a manager: they would be self-motivated and self-directed and know what to do and how to get the work done. The trouble is, true “go-getters” don’t exist. If you want effective team members, you need to take on the task of helping them grow into that role. All too often people hire what seems to be a star player and then 6-months later have to let them go because of poor performance and then wonder what happened to them. If you want somebody to meet your expectations, you need to make it clear what those expectations are, and you need to continuously give feedback so they can develop into the role you want them to fit. This doesn’t happen by accident. And no, this isn’t micromanagement. You aren’t nitpicking things that don’t matter because you wouldn’t have done them in exactly the same way, you are talking big picture things to make sure they are aligned with your vision. Do this regularly and you will build a trustworthy team that delivers results. Want more advice on how to effectively grow and manage your team? Check out Marcus’s website where he regularly writes essays on the subject or attend his seminars that can help you grow happy developers. Have you made the mistake of hiring without a real plan? How’d it work out for you? Share your story in the comments below.